Fun nail polish designs overflow my feed lately! I think I have a creative streak but I was never that artistic. I've seen the american flags for independence day, faux leather looking nails and rhinestones gallore. I rarely do nail art myself though. Instead, I go for bright fun colors like this one. In fact you may remember me discussing a very similar shade from covergirl just last year. I have myself convinced that that one is much more coral and pink and this more on the peach/orange side. What do you think? Regardless, this is one of my new favorite nail polishes this summer. As it turns out, the formulation and brush vary amongst this range. I adored the brush on the shade "Green with Envy" but this one seems a bit thicker and harder to work with. It takes 2-3 coats to build this shade up too, so if you have time and patience which most people don't have when it comes to nails, then it'll be fine I guess. It also isn't super fast drying, most likely because of all those coats needed. The lasting power is pretty great though. I got about 4-5 days wear with this one and that makes it all worth it. 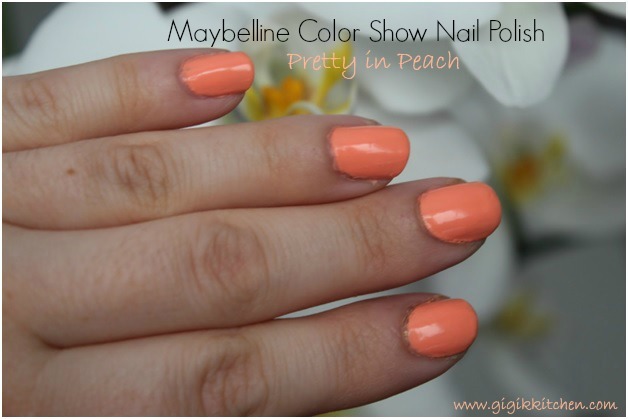 Have you tried these Maybelline Color Show Nail polishes? If you have which is your favorite shade? If not would you like to?